The Consumer Confidence and Monetary Base y/y data has been published in Japan and the US will release Natural Gas Storage, Prelim Unit Labor Costs q/q, Prelim Nonfarm Productivity q/q and Unemployment Claims. 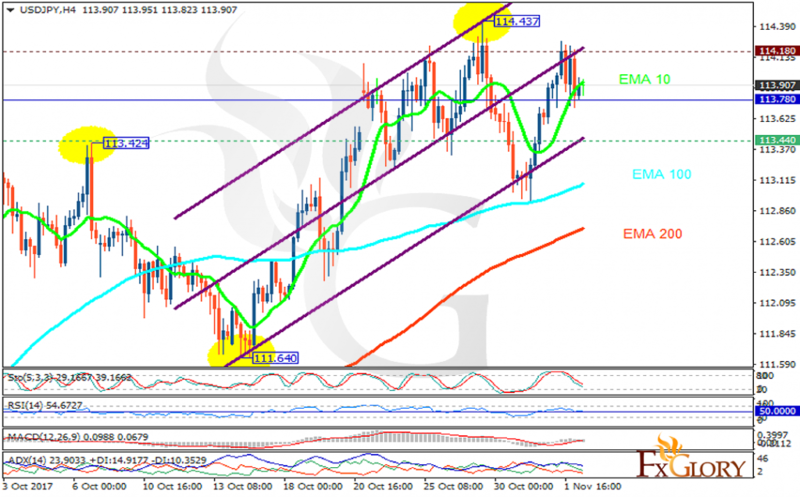 The support rests at 113.440 with resistance at 114.180 which the weekly pivot point at 113.780 is located in between the lines. The EMA of 10 is moving with bullish bias in the ascendant channel and it is above the EMA of 100 and the EMA of 200. The RSI is moving horizontally on 50 level, the Stochastic is showing downward momentum and the MACD indicator is in positive territory. The ADX is not showing any clear signals. While considering pullbacks on the way, buyers can target 114.40.